Excellent Free NY Times & USA Today Bestselling Author MMA Fighter Steamy Romance! Free NY Times Bestselling Author MMA Fighter Steamy Romance! Free NY Times Bestselling Author MMA Fighter Romance! 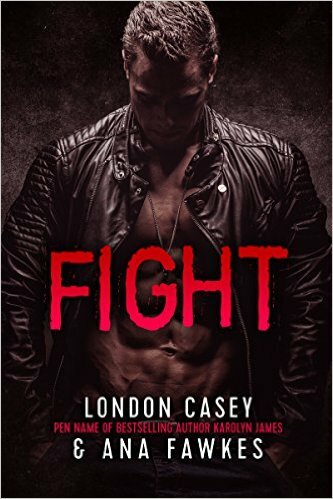 ***FIGHT (A Bad Boy MMA Romantic Suspense Novel) Kindle Edition by London Casey, Karolyn James, Ana W. Fawkes. Price: Free. Genre: Steamy Romance of the Day, Sponsor, NY Times Bestselling Author, Crime, Psychological, Action & Adventure, Romantic Suspense. Rated: 4.7 stars on 128 Reviews. 214 pages. ASIN: B01B8S01JW. NY Times Bestselling Author Karolyn James writing as Ana Fawkes. Reviewers love it: Delightfully ingenious and beautifully passionate! I was absolutely thrilled with every part of the story! There are enough twists and turns not only to grab your attention but steal the very breath from your lungs! Wildly incredible! *Ryder: Demonsong (Ryder Novels Book 1) (Deal, Not Free) by Luke Romyn. Price: $0.99. Genre: Fantasy Deal of the Day, Sponsor, USA Today Bestselling Author, Adventure, Paranormal & Urban. Rated: 4.8 stars on 14 Reviews. 486 pages. ASIN: B00SEFPS2S. USA Today Bestselling Author Luke Romyn. Reviewers like it: The first line cracked me up and set the tone for a great read! The whole book went by in a flash! What a phenomenal start into the science fiction world! Fast-paced, roller coaster ride that will make you question what you think you know about the world we live in! Posted on February 21, 2016 Author KibetCategories NY Times Bestseller, Romance8, USA Today BestsellerLeave a comment on Excellent Free NY Times & USA Today Bestselling Author MMA Fighter Steamy Romance! Excellent NY Times MMA Fighter Romance Free on Friday! ***FIGHT(A Bad Boy MMA Romantic Suspense Novel) Kindle Edition by London Casey, Karolyn James, Ana W. Fawkes. Price: Free. Genre: Adult Romance of the Day, Sponsor, NY Times Bestselling Author, Crime, Psychological, Action & Adventure, Contemporary Women, Romantic Comedy, Romantic Suspense, Women’s Fiction. Rated: 4.7 stars on 128 Reviews. 214 pages. ASIN: B01B8S01JW. NY Times Bestselling Author Karolyn James writing as Ana Fawkes. Reviewers love it: Delightfully ingenious and beautifully passionate! I was absolutely thrilled with every part of the story! There are enough twists and turns not only to grab your attention but steal the very breath from your lungs! Wildly incredible! Posted on February 19, 2016 February 19, 2016 Author KibetCategories NY Times Bestseller, Romance8Leave a comment on Excellent NY Times MMA Fighter Romance Free on Friday! *Circe’s Recruits: Gideon by Marie Harte. Price: Free. Genre: Steamy Romance, NY Times Bestselling Author Marie Harte, Military, Paranormal. Rated: 4.4 stars on 8 Reviews. 164 pages. ASIN: B0184DISVC. *Starr’s Awakening & Hearths of Fire (Red Starr, Book One) Kindle Edition by Kennedy Layne. Price: Free. Genre: Military Romance of the Day, USA Today Bestselling Author, Romantic Suspense, Suspense. Rated: 4.8 stars on 5 Reviews. 312 pages. ASIN: B01ANYBP4W. ***Loveable Christmas Angel (Angels with Attitudes Book 3) (Deal, Not Free) by Mimi Barbour. Price: $0.99. Genre: Adult Romance Deal, Sponsor, NY Times Bestselling Author, Christmas Romance, Fantasy, Contemporary Women, Women’s Fiction. Rated: 4.5 stars on 387 Reviews. 156 pages. ASIN: B00A2E7WJ6. NY Times Bestselling Author Mimi Barbour. Reviewers love it: Excellent read! This book took me to a place I have always wanted to go and made me feel as if I was already there! I cried happy tears! This is a story of Love and hope and overcoming obstacles.What a wonderful book! It was short, sweet and heartwarming! Thank you Mimi! I loved it! A sweet story for Christmas! Please Note: This is steamy, NOT Christian, NOT Clean. ***Bidding on Brooks: The Winslow Brothers #1 (The Blueberry Lane Series -The Winslow Brothers) by Katy Regnery. Price: Free. Genre: Contemporary Romance, Sagas, NY Times Bestselling Author, Family Saga. Rated: 4.6 stars on 94 Reviews. 256 pages. ASIN: B00TEB4HAU. NY Times Bestselling Author Katy Regnery. ***Eternal Island (The Eternal Series Book 1) by K.S. Haigwood, Ella Medler, K.C. Designs. Price: Free. Genre: Occult, Romantic Fantasy, Paranormal Romance, Vampires, Angels, Demons & Devils, Witches & Wizards. Rated: 4.7 stars on 121 Reviews. 358 pages. ASIN: B00YLH30I2. ***Fading (The Fading Series #1) by E.K. Blair. Price: Free. Genre: Steamy Romance, Coming of Age, Contemporary Romance. Rated: 4.4 stars on 399 Reviews. 459 pages. ASIN: B00DHW4N6K. Romance8 brings you free books and book deals from the very best authors. These include the NY Times Bestselling Authors, USA Today Bestsellers and those whose books have earned lots of accolades from reviewers. Watch [i.e. bookmark/favorite] this space for daily updates and please don’t forget to share!